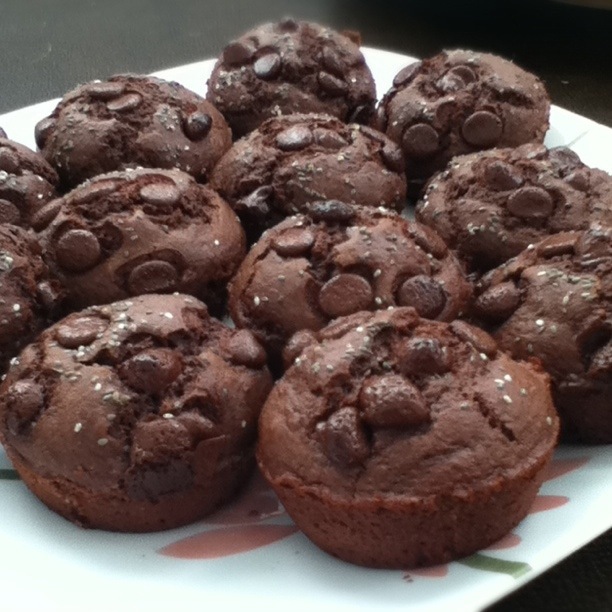 Jul 11 Make Something Monday: Healthy Brownie Cakes! Preheat oven to 350°. Sift flour, cocoa powder, & baking powder into a bowl. Whisk maple syrup, applesauce, oil, brown rice syrup, coffee, coconut milk & vanilla in another bowl. Fold wet ingredients into dry ingredients. Pour batter into greased muffin tins [I prefer all edge pieces for my brownies] about 3/4 full. Top each brownie cake with a few chocolate chips and a sprinkling of Chia seeds. Bake for 30 minutes or until a toothpick comes out nearly clean.